Windows Media Player comes with most versions of Windows, however in recent years Microsoft has dropped support for some older video formats which has made us quite angry. In the case that our videos don't play properly on your computer, we strongly recommend that you download and install the VLC Media Player. VLC is a great piece of software. It's free, it supports almost every video format, and it's available on a wide range of systems including Windows, Mac, Android, Linux, and more. 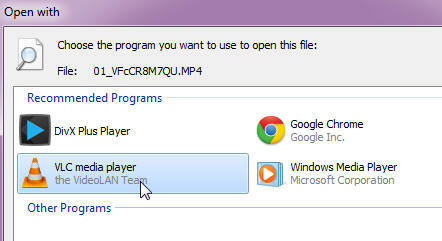 To download VLC, go to videolan.org and click on the big Download VLC link. NOTE: be careful of other web sites and software claiming to be VLC. I just did a quick Google search for "VLC" and found a couple of imposter sites - places offering to "sell" you VLC or some knock-off software with "bonus features." Don't download those. Make sure you go to videolan.org to download the authentic VLC. 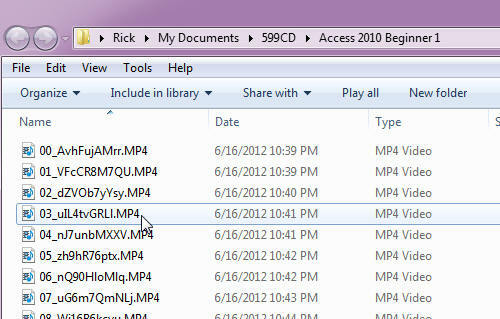 Open the folder containing your 599CD video files. You may or may not see the ".MP4" file extension. Don't worry about that. Select the VLC Media Player and then click OK.
Now when you double-click on one of these MP4 files, the VLC Media Player should be the default application that plays MP4 files on your system. If you have any additional questions, please contact us.